Now you stand before the face of God above. 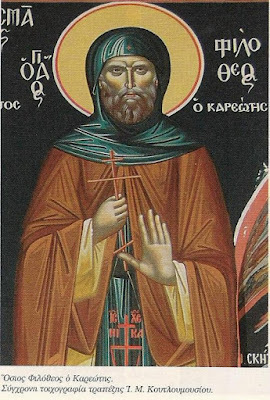 The venerable Philotheos was the Elder of the Cell of the Archangels of Dionysios Iagaris, in Karyes of Mount Athos. This Cell belonged to the Monastery of Great Lavra, and still exists today. There Elder Philotheos lived a life of virtue and asceticism, guiding others along the same path, including Saint Nektarios the Athonite. For his holy way of life he was graced by God with the gifts of clairvoyance and foresight. Philotheos, who truly loved God, reposed in deep old age, and departed to his desired Christ. He was buried at his Cell. A Service was composed in his honor by the hymnographer Gerasimos Mikragiannanitis.